The Halbmondlager (known in English as the "Half Moon Camp") was a prisoner-of-war camp in Wünsdorf (now part of Zossen), Germany, during the First World War. The camp housed between 4,000 and 5,000 Muslim prisoners of war who had fought for the Allied side. The intended purpose of the camp was to convince detainees to wage jihad against the United Kingdom and France. To that end, "detainees lived in relative luxury and were given everything they needed to practise their faith". 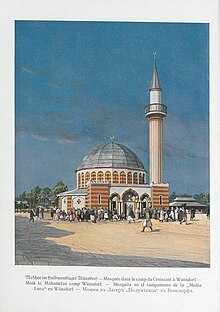 It was the site of the first mosque to be built in Germany, a large and ornate wooden structure finished in July 1915. The mosque, modelled on the Dome of the Rock, was demolished in 1925–26 owing to disrepair. There were also about 80 Sikh prisoners and some Hindus from British India held in the camp, an Australian aborigine soldier named Douglas Grant and around 50 Irishmen. A subcamp, known as Inderlager (Camp of Indians), was established to house prisoners from India who were not openly pro-British; those who were pro-British had been sent to other camps instead. The leader of the "jihad experiment" was Max von Oppenheim, a German diplomat and aristocrat. He established an office nearby to lead a propaganda campaign with the "show camp", "self-consciously styled as a theatre for the wider world", at its centre. Oppenheim was assisted by Shaykh Sâlih al-Sharîf, a Tunisian who had served in the Ottoman Empire's intelligence agency. He served as a spiritual leader for the detainees. Up to 3,000 of the detainees from the camp were recruited into the German Army to fight in North Africa and the Middle East. However, low morale and troop revolt plagued the resulting divisions, and few believed in the jihadist cause. In 1917 the remaining prisoners were put to agricultural labour in Romania. The story of the camp was largely omitted from English-language texts until nearly a century after the war. It was discussed extensively in German history works. ^ "Halbmondlager". Montreal Gazette. 13 August 2014. ^ a b c d e f Waters, Florence (10 August 2014). "Germany's Grand WWI Jihad Experiment". The Telegraph. ^ "Halbmondlager" (in German). m-haditec GmbH. 2006. Retrieved 8 September 2014. ^ Liebau, Heike (2010). The world in world wars: experiences, perceptions and perspectives from Africa and Asia. Brill. pp. 147–150. ISBN 9789004185456.